Lopetegui managed Porto up until last January. JULEN LOPETEGUI HAS been appointed as the new head coach of Spain, the Royal Spanish Football Federation (RFEF) has confirmed. The former Porto boss will take charge for an as-yet undisclosed length of time, following the resignation of Vicente del Bosque, who stood down after his side’s Euro 2016 exit at the hands of Italy. 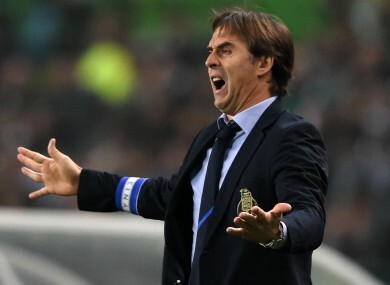 Lopetegui, who coached Spain’s U19, U20 and U21 sides prior to taking charge at Porto in 2014, had been linked with the manager’s job at Wolves, who are poised to undergo a takeover by a Chinese consortium. Former Granada boss Joaquin Caparros had been one of the favourites to take over at Spain, along with Paco Jemez, who was named the new coach of the Andalusian club this month. Lopetegui, who won a league title with Real Madrid and the Copa del Rey and UEFA Cup Winners’ Cup with Barcelona, won just one senior cap for Spain as a player. He will be presented by the RFEF at La Ciudad de Futbol in Madrid on Thursday. Email “Former Porto boss named as Spain's new head coach”. Feedback on “Former Porto boss named as Spain's new head coach”.